You know her as Brooklyn Bride - the wedding authority on planning a modern wedding in a world of pink flowers and poofy dresses. 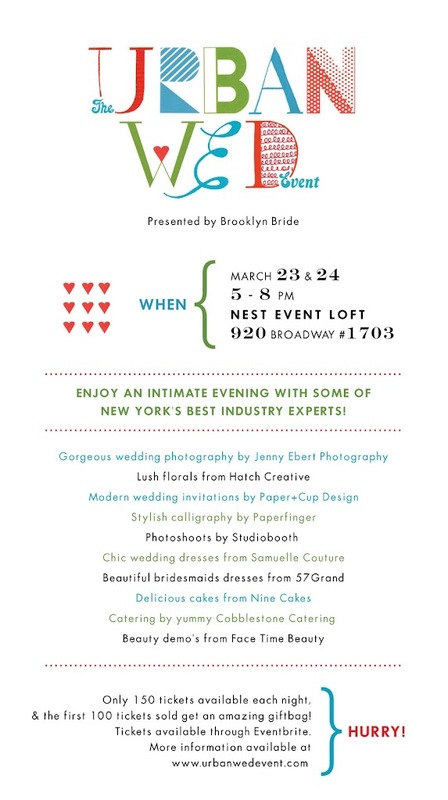 This March, Brooklyn Bride will be host to a small and intimate bridal event featuring 10 amazing vendors over 2 nights! Only 150 tickets will be available each night and the first 100 tickets sold will get a delightful gift bag. Tickets will be available through Eventbrite, and you can check the Urban Wed blog for more info as it comes!